We were engaged for 13 months for a few reasons 1) We wanted a fall wedding, and since we got engaged in October 2010, we knew there was no way to have a Fall 2010 wedding! And 2) All the books and wedding magazines tell you it takes a year to plan a wedding. Now hear this. There is no reason a wedding takes a year to plan. I recommend planning it over the course of 4-6 months. Why? By the time our wedding approached, I was starting to become annoyed about it. I just wanted it HERE. Month after month of spending money. And it becomes all anyone ever asks you about – “How’s the wedding planning coming along?” While the wedding was, of course, joyous, those last six weeks leading up to it were brutal. We were done with all major do list items that could be done, and time just dragged on and on. I started fantasizing about my post-wedding life and planning all sorts of post-wedding projects. Be flexible with your potential wedding dates and find a venue that that has availability within six months, and BOOK IT. You won’t regret it! Well, let me back up a second. We had an awesome venue (actually, it was a campground) that we were able to start setting up more than two days prior to our wedding day. If I had a traditional venue that only allowed a setup on the morning of, then I probably wouldn’t regret hiring a day-of-coordinator. However, if you are organized, have a clear vision, the discipline to execute it, and a firm timeline, the coordinator will just add more hassle to your life by asking you stupid questions. Umm, why yes I do know what I’m giving guests as favors. And yes, I know I should have all my bins and boxes labeled when I come to the venue. There will be a more in-depth post in the next few weeks about why I HATED having a day-of-coordinator. HATED. Had a dress custom made. 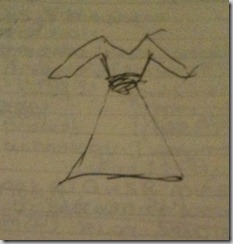 I had a very clear vision for what I wanted my wedding dress to look like. But I was never able to find it. As a compromise, I established some key criteria for my wedding dress. I was offered my grandmother’s wedding dress (I talk about that in the same post), which I considered having cut and made into the dress I wanted, but I ultimately decided against it. While I liked both the dresses I wore on my wedding day, I still would’ve liked to have worn the one I had envisioned all along. 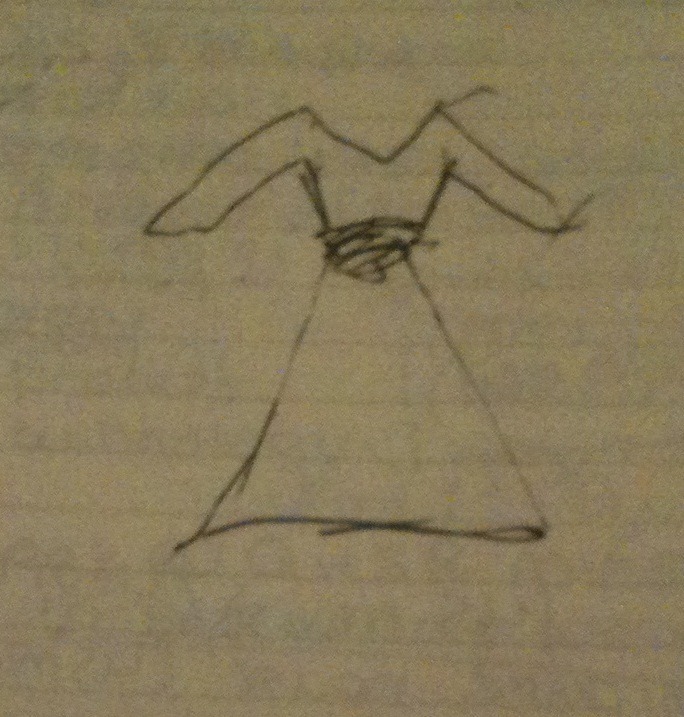 Here is a sketch (ahem, a very crude sketch) I made early on in the wedding planning process of how I envisioned my wedding dress. Tea length, v-neck, with 3/4 length sleeves. And apparently some weird ruching thing on the waist! If you do decide to drag out your engagement for a year, there’s a period of time in the middle when you’re kind of in a lull. You’ve booked your venue and other priority vendors, but you’re not ready to book other things or start buy decor that will just clutter your house for the next nine months. What would I classify as the more “boring” details? In my opinion (and I realize others may be different!) things like the ceremony readings, ceremony music, making iPod deejay playlists, and designing your wedding program could’ve all been done much earlier than I did them. Look, we all want to save money on our wedding. But seriously, if you spend 3 hours researching the best prices to buy table runners and you save yourself 15 bucks, was it really that worth it? After hours of researching something and delaying decisions in hopes of finding something better and/or less expensive, I would feel just so completely unproductive. This was one of my bigger worries. In fact, it tied with “weather” as the “Biggest Stressor” in my wedding superlatives post. In the end, we invited 287 people. Way too many. I have no idea how that happened. Both my parents are only children, and therefore I have no aunts, no uncles, and no cousins. Ken has a bigger family, but not huge. Our venue had seating for 160 people. With extra table rentals, we could probably fit another 50-75 people comfortably. But, of course, that adds significant costs. So, we were relying on a very high “regretfully decline” rate in order to not be packed in our venue like sardines. I’m a little ashamed to admit that with every RSVP regret we received, I breathed a little sigh of relief! Our officiant was a long-time friend (and pastor) of Ken’s family. Our day-of-coordinator was a woman from the neighborhood that owns a concierge business. While everything worked out great in the end with the officiant, even after some initial hiccups, he was not the most responsive guy. About a week before the wedding, we were worried that he never submitted the paperwork he needed to officiate a wedding in Virginia (because he’s a pastor in Maryland, he needed special approval to officiate a wedding in Virginia). And he wasn’t returning our phone calls, which was really worrisome. We also knew personally our day-of-coordinator, and I have a feeling that I would’ve been much more comfortable with someone that I didn’t know. Someone that I could say to, “No, that’s a terrible idea,” and not have to worry about facing them after the wedding. Because, frankly, she had too many terrible ideas and I never told her outright they were terrible because I knew I’d still have to live in the same neighborhood as she does. You are so right about long engagements. We had 6 months from our engagement to our wedding. It was such a blessing in disguise. People said I was crazy planning a wedding in 6 months, but by month 2 I was done. Everything booked, dress bought, invites out, rings purchased. Then I waited 4 months. Then finished the last remaining little things in the last 3-4 weeks before the wedding. It was perfect. I’m getting married on September 28th, 2012, and we got engaged……wait for it…………..November 19th, 2010 LOL. Again, we knew we wanted to get married in September, and given that I have an infamous temper problem combined with an equally infamous indecisive streak, we thought it would be best to not plan a wedding in less than a year, especially since we’re planning it from out of town – we’re having a “destination” wedding at the outer banks. Lo and behold, we went to the outer banks wedding expo this past January, and by the time we left, we knew exactly who we wanted to hire for catering, the cake, the DJ, the day-of planner (which we only booked since we’re planning it from DC), florist, AND hair and makeup. I was stunned at how easy it was to pick people! So now, I am sitting here twiddling my thumbs 😛 haha.